An authentic Pad Thai recipe for real vegetarian Thai food lovers, or those who want a lighter noodle dish without the meat. This Pad Thai recipe does offer adequate protein in the form of eggs (vegans can omit this ingredient), and ground nuts. Plus, because it's made with rice noodles, Pad Thai is a gluten free recipe. Cut the kale into short lengths and remove hulls and root tips from the bean sprouts. Heat oil in a wok over high heat and add the small rice noodles, sweet soy sauce and water and stir fry for several minutes. Add cubes of tofu, kale and the remaining ingredients and continue to stir fry until done. 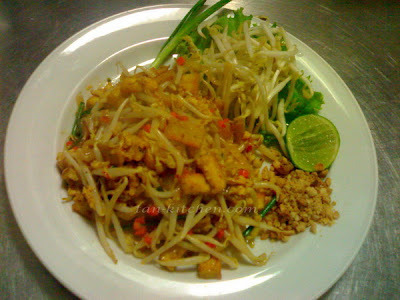 Serve the Pad Thai with lime wedges, ground roasted peanuts and bean sprouts and fresh kale, more taste by banana flower. If you like spicy you can also add dried chilli.